All interned European women and children (with the exception of boys from 8 or 10 years of age) from Aceh, Tapanoeli and East Sumatra were held in the camps of Aek Pamienke (Aik Pamienke, Aek Paminke, Aek Pamengke) for the last month of the Japanese occupation. The camps were located on a rubber plantation of 3.316 hectares in Aek Pamienke. This was part of the Asahan Culture Company Ltd., located around 30 kilometres north of Rantau Prapat at the Asahan railroad. In the months from April to July 1945 there were three large camp barracks built along the plantation road, with a lorry track between station Aek Pamienke and Bandardoerian. 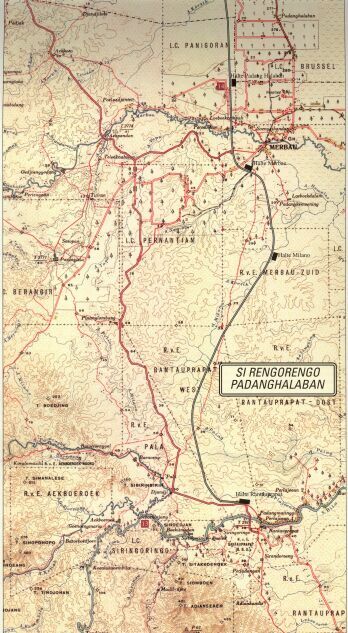 There was also a rubber factory on the Rantau Prapat – Kisaran Road. These camps were in extremely primitive conditions lacking many facilities. Nearly 5000 women and children were interned here. During the last month many died of sickness and exhaustion. The Japanese surrender was announced here on August 24, 1945. (Dulm 2000: 49).